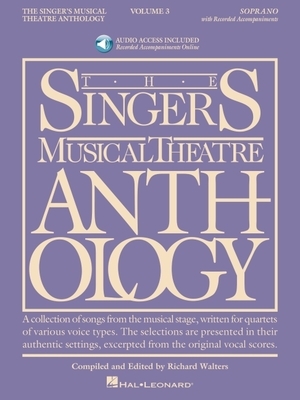 The Singer's Musical Theatre Anthology - Volume 3: Soprano Book/Online Audio [With 2 CDs] (Singers Musical Theater Anthology #3) (Paperback) | The Drama Book Shop, Inc.
(Vocal Collection). The world's most trusted source for great theatre literature for singing actors. The audio includes professionally-recorded piano accompaniments. The book features authentic editions of each song in the original keys. The songs have been carefully chosen for each voice type and are culled from a wide selection of classic and contemporary shows. Contents: THE APPLE TREE: Feelings * BRIGADOON: Waitin' for My Dearie * CAMELOT: Before I Gaze at You Again * CHICAGO: A Little Bit of Good * CINDERELLA: In My Own Little Corner * COWGIRLS: From Chopin to Country * EVENING PRIMROSE: I Remember * HELLO, DOLLY : * Ribbons Down My Back * JACQUES BREL IS ALIVE AND WELL AND LIVING IN PARIS: Sons Of * LEKYLL & HYDE: Once Upon a Dream, In His Eyes * THE KING AND I: Getting to Know You * KNICKERBOCKER HOLIDAY: It Never Was You * LADY IN THE DARK: One Life to Live * LES MISERABLES: In My Life * LOST IN THE STARS: Stay Well, Trouble Man * LOVE LIFE: Mr. Right * MARRY ME A LITTLE: The Girls of Summer * MARTIN GUERRE: How Many Tears? * ME AND MY GIRL: Once You Lose Your Heart * MY FAIR LADY: Wouldn't It Be Loverly, Just You Wait * NAUGHTY MARIETTA: Ah Sweet Mystery of Life, Italian Street Song * OH, KAY : Someone to Watch Over Me * ON YOUR TOES: There's a Small Hotel * THE PHANTOM OF THE OPERA: Think of Me, Wishing You Were Somehow Here Again * PIPE DREAM: Sweet Thursday * PRINCESS IDA: Oh, Goddess Wise * SATURDAY NIGHT: So Many People * SONG AND DANCE: Unexpected Song * SONGS FOR A NEW WORLD: Christmas Lullaby * THE SOUND OF MUSIC: Something Good, I Have Confidence, My Favorite Things * TITANIC: Still * WHERE'S CHARLEY? : The Woman in His Room * WHISTLE DOWN THE WIND: Whistle Down the Wind The audio is accessed online using the unique code inside each book and can be streamed or downloaded. The audio files include PLAYBACK], a multi-functional audio player that allows you to slow down audio without changing pitch, set loop points, change keys, and pan left or right.